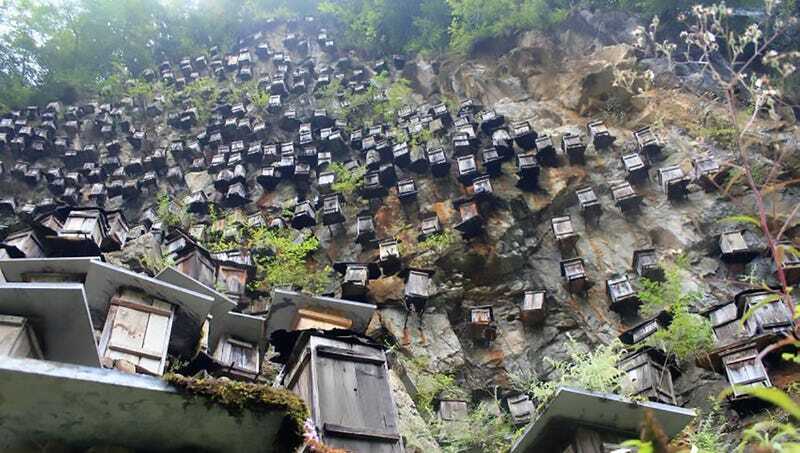 Beekeepers from China’s Hubei province have attached over 700 beehives to the face of a steep cliff in the Shennogjia Forestry Reserve. It’s an awesome—if not intimidating—sight, but it’s an effort to create new habitat for the endangered species. As reported in Xinhua, these beehives were set up by beekeepers on Muyu Village’s Guanmen Mountain, which is over a kilometer above sea level. The bees native to the region belong to the Apis cerana species, also known as the Asiatic honeybees, which can be found throughout central China. However, the Asiatic honeybees colonies have dramatically diminished, and...the honeybees of North and Northeast China have already died out. Local Muyu beekeepers are working hard to keep the Asiatic honeybees alive, which is why they built the hundreds of beehives and climbed high on the steep cliff face to attach the structures. The handmade structures and precipitous locations were selected to emulate the wild bees’ natural habitat. Their efforts are one of the reasons why the Shennongjia forestry reserve is largely considered a safe sanctuary for the Asiatic honeybees. More at Inhabitat, including a stunning gallery of photos.